Upon seeing A Clockwork Orange at the age of 16, my concept of what a film could be were forever changed. The film is a genre-defying, hyper-stylized, ultra-theatrical slice of the darkly ironic and absurd, and to me, Kubrick's powerful dissection of the nature of violence remains one his strongest and most uncomfortably enjoyable works — it's even where this blog takes it name. A cold and unforgiving dystopia with a darkly sadistic sense of humor, Vincent Canby of The New York Times called A Clockwork Orange "even more technically interesting than 2001." And despite all of its disturbing elements, its proportionally balanced by its thought-provoking quality. To me, it's art to the highest degree; a truly one of a kind experience. To pay homage to one of this site's favorite films, we're embarking on "a little of the old ultraviolence" with some fun facts about the production. "Viddy well, little brother, viddy well!" Kubrick was initially on the fence. Dr. Strangelove co-writer, Terry Southern, first brought Anthony Burgess' novel to Kubrick's attention while on set of Strangelove. Southern enjoyed the book for its biting dark humor, and he thought Kubrick should seriously consider adapting it. Allegedly, Kubrick disliked the book after his first reading because of the Russian-influenced English slang Burgess created for the novel, referred to as Nadsat. He found the language confusing initially, but changed his mind after his plans for a Napoleon biopic (which you can read more about here) fell through because he began to consider Alex as a Richard III-type character. Kubrick used a lot of actual locations. After making the very expensive 2001: A Space Odyssey, Kubrick wanted to prove that he could make a low-budget film. So, instead of spending resources constructing sets, he opted to search for existing locations that fit the aesthetic he was going for; however, there was one exception: the location had to be within driving distance from his London home. Despite the oddly specific condition Kubrick put in place, the location scouts were able to accommodate this need. Alex's apartment block was shot at the Thamesmead Housing Estate in Southeast London that was constructed in the late 60s. The writer's "HOME" was actually three separate locations: the road leading to the estate was outside Munden House in Bricket Wood, Hertfordshire; the exteriors of the house were shot at The Japanese Garden in Shipton-under-Wychwood in Oxforshire; and the interior was The Skybreak House in Radlett, Hertfordshire, with the art covering the interior painted by Kubrick's wife, Christiane. 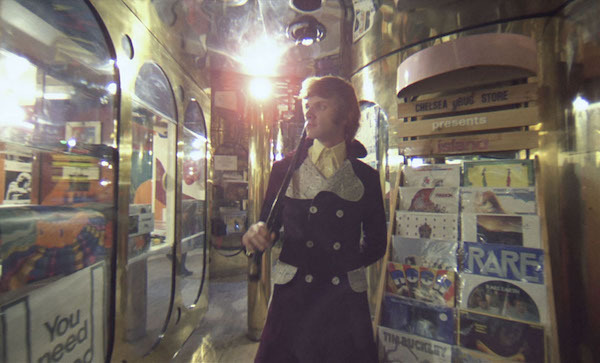 The record shop was shot at the Chelsea Drugstore, a stylish London bar that was frequented by the Rolling Stones — and bonus fact: Mick Jagger originally acquired the rights for $500 when he needed quick cash, and intended to make the film with The Stones as the droogs. There were only three scenes in the film that required the construction of a set: The Korova Milk Bar, the prison's check-in area, and the bathroom where Alex takes a bath in the writer's "HOME." These sets were constructed in an old factory in Borehamwood, Hertfordshire, and Kubrick enjoyed shooting there most of all because it was the closest in proximity to his house. While designer Milena Canonero initially sought to create a skewed quasi-futuristic wardrobe for the film, she and Kubrick were having difficulty pinning down the overall look for Alex's costume. Their struggles would be put to an end with the help of McDowell, who was a big cricket fan. One day, he came in to a costume fitting in full cricket gear, including the protective cup, and Kubrick, struck with inspiration, instructed McDowell to incorporate his white shirt and jock into the costume. McDowell began to dress with the jockstrap under his pants, but Kubrick told him it would look better over his pants, which of course made its way into the finished film. In addition to wardrobe, McDowell came up with the idea to sing the Gene Kelly classic "Singin' In The Rain." Kubrick thought the scene in which Alex and his droogs attack the writer and wife was playing a bit flat during the rehearsals. He thought the scene would more adequately convey the ominous nature of Alex's character if he did something contradictory, such as dancing. During the next run through, McDowell began humming the only song he could remember, which just so happened to be "Singin' In The Rain." Kubrick thought the song fit the scene perfectly and immediately bought the rights for $10,000. McDowell later commented: "And why did I do that? Because [that song is] Hollywood's gift to the world of euphoria. And that's what the character is feeling at the time." Gene Kelly was less than euphoric about the film's use of his famous song, and would later walk away in disgust when meeting McDowell at a party. McDowell's dedications also lended themselves to more physical contributions, as he was forced to endure excruciating pain during the Ludovico scenes. The eye clamps were only supposed to be used for patients lying down, but Kubrick insisted that the character be sitting up watching footage for his rehabilitation. This caused McDowell to slice his cornea, which forced the infamous perfectionist to cut the shoot short, and he also suffered cracked ribs during the filming of the stage show humilation. Kubrick pulled the film in the UK due to death threats. The film was subject to some controversy surrounding a series of alleged copycat break-ins and murders within the UK area in the early 70s, which were further exacerbated by the press. Despite the controversy, the film remained in theaters and was available for distribution until Kubrick put in a request to Warner Bros. to pull the move from UK cinemas. Kubrick requested that the film be removed after having received a death threat against him and his family while on set of his follow-up feature, Barry Lyndon. Reportedly, the perpetrators promised to break into his secluded London home to carry out attacks similar to Alex and his droogs. After Kubrick's call, the film remained out of circulation from 1976 until Kubrick’s death in 1999, further adding to its cult appeal and causing fans to seek out bootleg VHS copies from abroad. Kubrick and McDowell got along famously all throughout their work on A Clockwork Orange, and to ease the tension in between voiceover work, they'd play games — generally ping pong or chess. McDowell claims to have dominated Kubrick in pool (who regularly destroyed him in games of chess). The voiceover work spanned a total of two weeks, but McDowell was only given one week's pay. When Kubrick was confronted by McDowell, he told him that he confirmed with his records and the payment was accurate because one week has been spent playing ping-pong.